1. 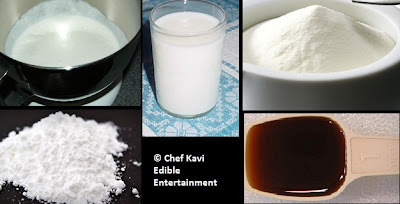 Mix sugar & cornflour in the milk & heat it for 1 minute. 2. After the sugar dissolves & the cornflour makes the milk thick, add the vanilla extract, milk powder & heavy cream. 3. Beat the mixture very well for about 10 minutes with a manual whipper or 3-4 minutes with an electric whisk. 5. Take it out of the freezer. Separate the mixture into two bowls & whip/beat separately. You can also put the entire semi-set ice cream into a blender & blend it for about 1 minute until the ice particles break. 6. Again, put it in the freezer for about 4 hours. Then get it out, whip/beat for about 2 minutes, and freeze again. 7. You can do this process for about 3-4 times. 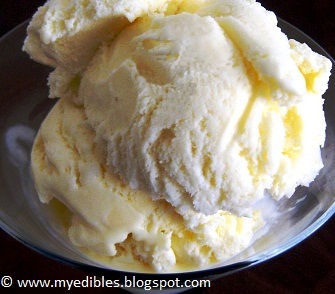 This gives the ice cream a smooth texture. 8. Finally, pour it in an air tight container & freeze. Nice one, Kavi! Sounds pretty simple!